Dreams can be so perplexing sometimes. You wake up and think where on earth did that come from? The meaning of a recent dream I had was crystal clear and most pleasurable. It all stemmed from an old tree. There is a gnarled and wizened apple tree at Howlets, a hundred year old stone house, of which I have the pleasure of acting as project manager. Howlets sits on an exposed-to-the-sea piece of land with rock ledge and a thin layer of soil sitting atop. In the front yard there is a very old and twisted apple tree that has somehow stayed alive in this most inhospitable spot. 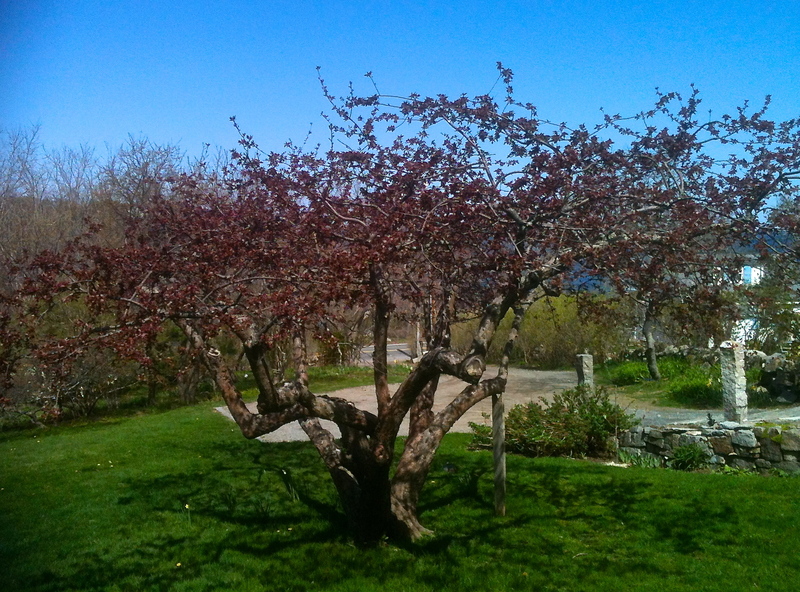 Buffeted by sea salt-soaked rain and heavy winds, it is a most unlikely place for a fruit tree to thrive. Fruit trees need trimming, thinning and pruning on a constant basis. 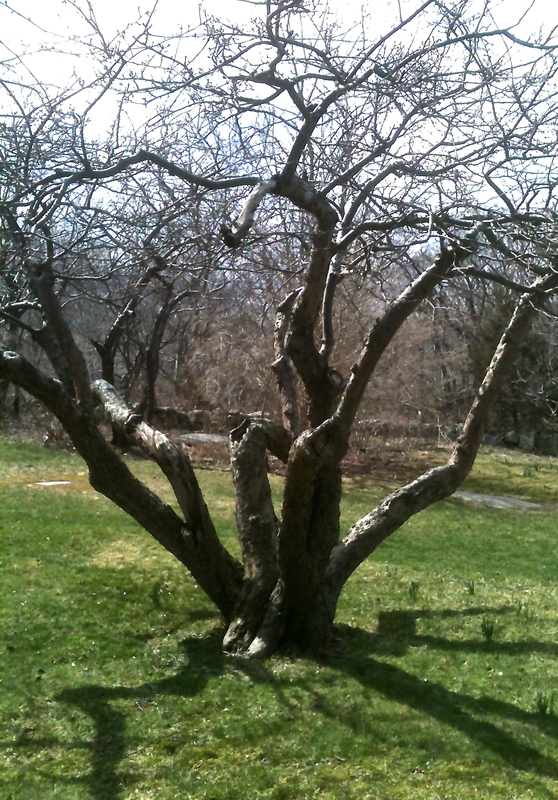 This apple tree had been clearly cared for over time but in recent years had been let go. Sucker growth spurted directly skyward and limbs crisscrossed each other. Beneath all of this tangle there was a proud survivor. Having lived in Japan and watched the way in which the Japanese trim their old fruit trees, I had a clear idea as to what the tree should look like. Looking carefully at the old cuts made on this apple tree, someone else, years ago, had the same vision. The form just needed to be brought back. I very much wanted to trim the tree myself. As I began the process, a Zen-like feeling settled in and I just knew instinctively what should go and what should stay, like sculpting. The whorled trunks were cleared of sucker growth, the thick growth at the ends of branches thinned and the shape brought back. After a debrief of the work with David and Heather, the owners of Howlets, and a glass of their wine, I went home and fell into a dreamful sleep. In the dream my profession was very specific: expert trimmer of only aged and visually interesting cherry and apple trees. Dressed in a rough shapeless linen coat and chewed up straw hat, I happily travelled the world, carefully trimming these ancient specimens for appreciative and fascinating clients. A wide variety of surgical-like snippers and clippers accompanied me, each one designed for a specific pruning task. These tools of the trade were all tucked neatly into a heavy canvas fold over envelope with individual pockets complete with leather closure straps. Everyone needs a dream of what they want to do when they finally grow up. My sleep-fueled unconscious found the perfect career, taking full advantage of my OCD-ish tendencies. Now I just need those adoring clients ready to fly me in to prune their trees. That was your best yet, Tom. I think you need to write that tree-pruner’s memoirs. I figure he came into possession of the chewed straw hat a lifetime ago. Maybe that’s Chapter 1? I second Susan; this was a lovely piece. And surely there are so many trees like the one in your post, waiting for a sympathetic soul to come along. The visual of the shapeless linen coat and the chewed-up hat made it seem so real, even to the reader. I think your dream is fodder for the next Terrence Malick film. The tree is so beautiful now. You are an artist. You nailed it! The tree looks beautiful.